You are here: Home » MEDIA » Books » I’ll Be In My Trailer by John Badham & Craig Modderno (book review). 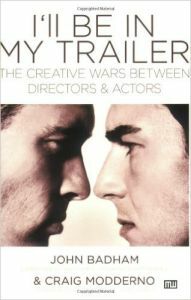 I’ll Be In My Trailer by John Badham & Craig Modderno (book review). The title ‘I’ll Be In My Trailer’ is the actor’s recognised excuse of not wanting to do as a director wants in a film. In many respects, the sub-title ‘The Creative Wars Between Directors & Actors’ isn’t really needed for director John Badham and journalist Craig Modderno’s book. Well, unless you didn’t know the term. Like with other recent books reviewed from Michael Wiese Productions, this one is to provide a middle ground for directors to understand the actors needs on a set. Considering the number of actors who are interviewed for their points of view from various films they’ve been in, I presume they also will be reading the book. It would be interesting to see a book where directors could explain what they want from their cast but from what John Badham says, modern day directors lack people skills and don’t know what to tell them so maybe it’s more like they can’t or certainly not have it explained how to do it. Books such as this shows there is a middle ground that can satisfy both parties artistic needs. As many of you are getting a hankering for making small films, understanding both sides of the fence can only enhance your skills, more so if you’re directing amateur actors and need to explain what is needed. That is essentially the emotion impact of the scene than anything else. Reading this book, it becomes obvious that the actors are more concerned with staying within what their characters would do and sometimes the director might forget that. Equally, the director has to be capable of pointing out when an actor’s performance isn’t quite there as in many ways, they are the surrogate viewer and representative of the paying audience. I’m beginning to wonder why they never have an arbitrator on set. Ever self-depreciating, Badham gives some humorous examples from his own career as well. There’s a lot of anecdotal information given in the book and some surprises as well. Actor James Wood points out that ‘method’ acting was a mistake and the writers point out that most actors only read Straislavsky’s first book ‘The Actor Prepares’ and forgot to read its sequel ‘Building The Character’. As with anything, actors have to appear natural to the camera and there is strong emphasis that directors should take acting and psychology classes to understand the mind process and understand the inner child which actors use to play. The techniques of read through and rehearsal should be read by all, including actors and especially in the amateur arena. I suspect that with the latter there is more imagination than thought on how the pros do it. In many respects, I found this similar to writing. By that I mean, I can rough out a scene and sort out sub-text and detail later. If something doesn’t work, I can go over it without wasting time. Odd that this technique isn’t applied in scriptwriting where some of the original spontaneity must surely be lost through the countless writers polish. From my perspective, it would serve films better had the original writer had or developed the skills in all areas than be seen as areas where other writers with better skills in the missed areas steps in. After all, how does a writer improve in those areas if he or she knows someone else will sort it out? The most remarkable thing I discovered half-way was how quickly I got caught into the information each time there was some revelation. The descriptions of how action scenes were shot based on ‘No conflict, no action!’ and to be effective the actors need to know what is needed. Pressing the cast to work out what they need to do in their parts and encouraging them to do so is the best way. Getting them to socialise and getting to know each other before filming is also the way to ensure they are all on the same page when filming. Although thinking about that now and where some actors are told to keep away from other actors so they get a more adverse reaction on set must make this awfully confusing. For ‘Alien’, Yaphett Kotto was told to do this to Sigourney Weaver. If you can’t come away from this book without understanding and learning a few tricks of the trade to put actors at ease or get around problems when older actors need help remembering their lines then your career as a director is going to be limited. All too often, we as viewers, don’t really see what goes on behind the scenes to get the accepted perfection we see on screen so a lot of this book will be eye-opener for those who read. Directors have to be leaders, authoritative and flexible. This book has been quite an eye-opener, more from the amount of quotes from films as anything. Although an SF connections are minimal, the techniques are applied to all film and if you are planning directing in the amateur or pro world, you will find this book a valuable read. From a writer’s POV, I’m beginning to understanding the mood of the scene and I think its crept into my own stories. Action! « By The Stars (Embracing Entropy book 1) by Jessica Marie Baumgartner (ebook review).